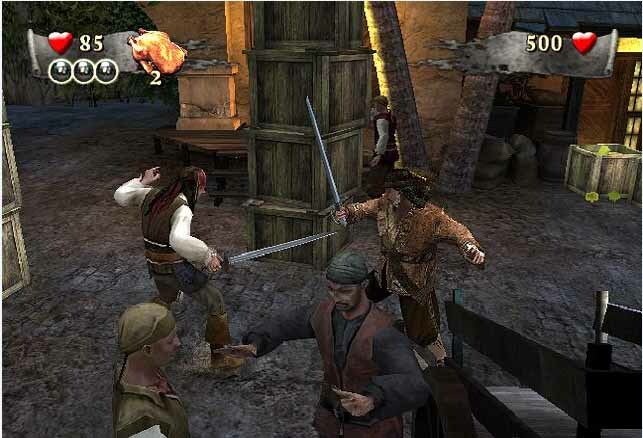 Free download Pirates of Caribbean: At World’s End PC game. It is a full of action game and it is inspired by the original movie. It is developed by Disney. The scenes and locations of this game is combination of two movies, At World’s End and Dead man’s Chest. You’ll be Captain Jack Sparrow himself in this game. You have to fight with the sword which is very interesting thing of this game. You’ll face a lot of enemies in the way to escape from the prison to save your life and to find the Black Pearl ship which is owned by Captain Jack Sparrow. You have to escape all the pirates from that prison too with yourself. When you download this game then extract it as it‘ll be in zip format. After extracting it, go to its folder then you’ll find at the top of folder ‘autoplay.exe’, double click on this and then click on ‘install game’. If it doesn’t work for you then go to the very first folder ‘setup’ then in the middle of folder you’ll see ‘setup.exe’ double click on this and wait for a while, you are done, enjoy the game now. You have to choose the story mode to play this game, in start of this game captain Jack Sparrow will be in jail then a helper came to escape him and give him a sword to escape himself and tell him to escape all of his pirates’ companions from the prison too. Then you have to find all pirates fellows and save them. The game will give you the hint in the form of yellow spot, you should go on yellow spot and after that press ‘Enter key’ then instructions will be given to support you and it’ll guide you to escape from the prison and go to Black Pearl ship. You have to fight the number of powerful enemies in your way. You can fight with sword by using z, x and c buttons on keyboard to defeat and kill them all of your foes.